Lynn Nottage’s 2017 Pulitzer Prize winning play, Sweat, opened at A.C.T.’s Geary Theater this past week. The play focuses on workers at a steel mill whose work slowly erodes until finally they are without jobs, and according to Nottage, without identity, marginalized. It was clear the audience wanted to love this play, and it was well cast, well acted and well presented. It is notable that Nottage remarks in the program notes that the Washington D.C. audience received the play rather coolly, “I felt the audience was much more resistant to the narrative and a little standoffish, like, ‘We don’t need to be told this.’ But clearly they did.” Oddly, I have to agree with that audience, we have been told this, quite a bit. Every speech sounded like a cliché of the stereotypical working class Trump supporter’s complaints. Even further, none of the characters portrayed was particularly sympathetic or compassionate. And if you are going to write about the dilemma of the working class then sympathy seems a necessity. 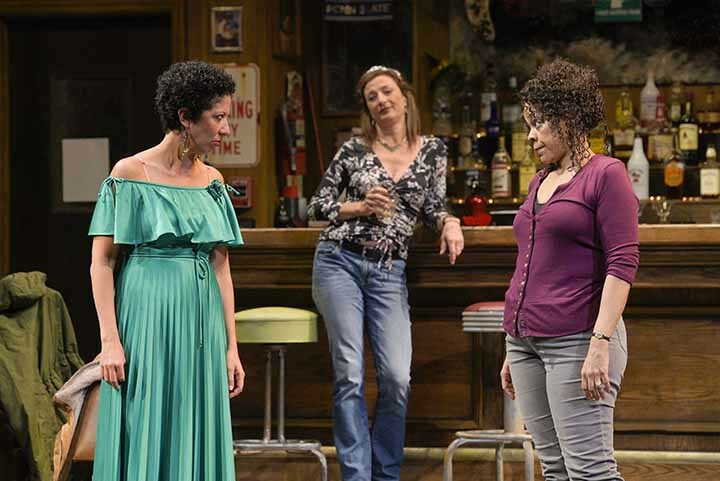 Jessie (Sarah Nina Hayon) and Cynthia (Tonye Patano) discuss the rumors that their jobs could be outsourced to Mexico while Tracey (Lise Bruneau) looks on in “Sweat,” now at A.C.T.’s Geary Theater. Photo by Kevin Berne. One of the lead female characters, Tracey (Lise Bruneau), and it’s unclear to me if director Loretta Greco was attempting to make her character as unpleasant as she seems or if that’s built inexorably into the script, is a bully who tries to keep the American–born Hispanic Oscar (Jed Parsario) from a job in the steel mills because that’s her family’s territory, not his, and who blames the fall of the steel industry and her job on her fellow worker Cynthia, who competitively succeeds at landing a management job that Tracey had applied to as well. When her job collapses and the union is unable to battle effectively against management, does Tracey want to take her union’s offer to retrain into a more viable profession? No. But that’s more understandable, if you’ve been working in an industry for 20 years and worked your way up to $60–70,000 a year (which presumably goes a lot farther in the Steel Belt than it does in the Bay Area) with decent health insurance and benefits, you may not want to start at entry-level in another field. None of us, however, may be able to change the drift of technology any more than it was possible to stop the bronze age from giving way to the iron age. Yes, NAFTA is mentioned, but no details are given, and at this time and place, NAFTA might not be the real cause of the steel industry buckling. Under the current administration’s tariffs, the steel industry is said to be booming, but if an article in the Washington Post is to be believed, steel industry workers are not seeing much of that new coin. Jessie (Sarah Nina Hayon) spends most of the play drunk with her head on the barroom table. This dated before the dizzying descent of the post–NAFTA industry by the elegant super graphics by Hana S. Kim projected above the stage that reveal the time and place of the scene. Cynthia (Tonye Patano) is the most admirable of the characters. Ambitiously, she applies for and gets a management job, the break she has hoped for apparently for 20-plus years. But she is soon to find out that she has been played the fool by a management that wants to drive down its workers’ wages and benefits and is looking for a fall guy for the workers’ anger. When the business collapses, she finds a low-paying job and soldiers on. Tracey’s son, Jason (David Darrow), and Cynthia’s son, Chris (Kadeem Ali Harris), seem to be the fruit that didn’t fall far from the tree. Both of them, especially Jason, begin the action by being confronted by Parole Officer Evan (Adrian Roberts) for a crime that is revealed during the course of the play. The crime is an act of stupidity and bigotry that goes wrong, ending in the victimization of Stan (Rod Gnapp), bartender and mediator of his working-class clients’ anger. Cynthia’s unemployed ex, Brucie (Chiké Johnson), is a bit of a grifter, plying his questionably persuasive talents on those around him, especially Cynthia. What was missing in this play was a more plausible source of these people’s problems than mere ignorance and narrowness: the men in the suits. Those guys who believe that success is only possible with a 20-percent profit margin increase each year, and who are willing to connive continuously on how to extract that money out of their over-burdened workers, as necessary. And those who would ignore shifts in technology in order to extract as much profit as possible before their industries become out-of-date or, worse, obsolete. They are referred to in the play but in such abstract form that it’s nearly impossible to see, much less analyze, their power and influence. The majority of the workers presented in the play are women. Nottage wanted to show that “not only men are steelworkers. There are a lot of women in the steel industry.” According to the statistics I found, about 20 percent of the steel industry is women, and around 13 percent work “on the floor” in manufacturing jobs. Nottage says she “didn’t want to draw any conclusions” with the play, but instead hopes the play opens discussion about the industry, and problems of the working class. Maybe it does. But it doesn’t get anywhere near where the problems lie in industry, or in our deeply divided culture. Don’t take my word for it, though, check out the play. Sweat continues at A.C.T.’s Geary Theater through October 21. For tickets and information, visit act-sf.org.